Let's pull an oldie out of the vault. I get so caught up posting current manis, I forget about some I did eh chem, two months ago. But since I broke my middle nail on BOTH hands, you'll be getting to see some I forgot to post! 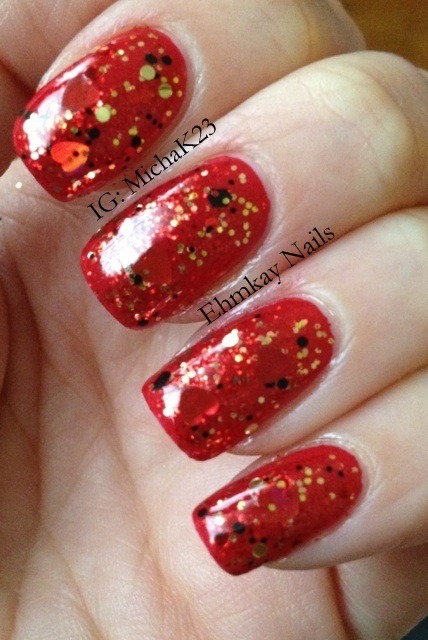 This manicure was such trial and error. I simply could not find a base I liked with this glitter. I did an entire nail wheel of bases and regretted purchasing the glitter. Then I won a giveaway at Orly and won the Hope and Freedom collection and using Elation Generation was PERFECT (and this was a tip from Jen! She was spot on!). 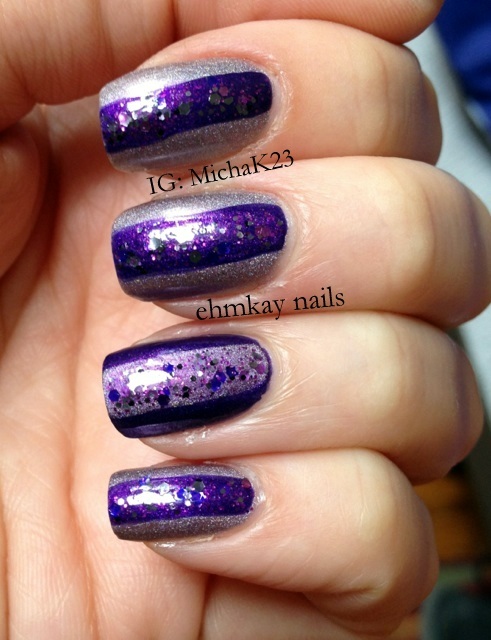 Two coats of Elation Generation which is a squishy jelly scattered holographic. 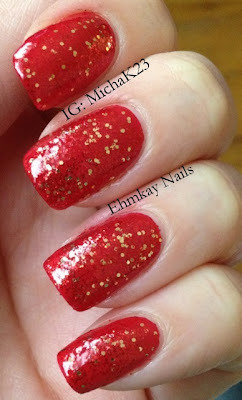 Then I added one coat of China Glaze Make a Spectacle (which I use all the time) and the gold tones really shone over EG. 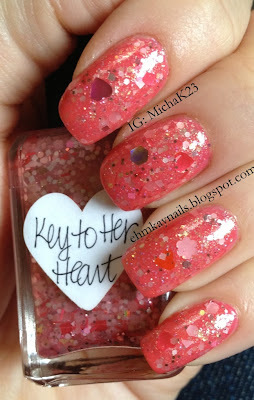 Lastly, I used one to 1.5 coats of Lynnderella Key to Her Heart. Turns out, I'm obsessed with flower glitter! I love it! I need MOAR. I also love the color shift of the heart on my index finger. It gets crazy. There are also three different colored hearts on this hand alone! You'll want to enlarge these pics, trust me. I could not get color accurate pictures of Elation Generation alone (darn doing my nails at night!) so you can tell the base in the pictures above. Here is a meh picture of EG topped with ChG MaS to see where the gold tones pull in (and to show that they aren't from KTHH). I love glitter. The end. 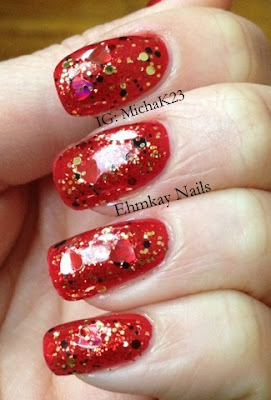 Here is an NOTD I did a while ago and loved so much! 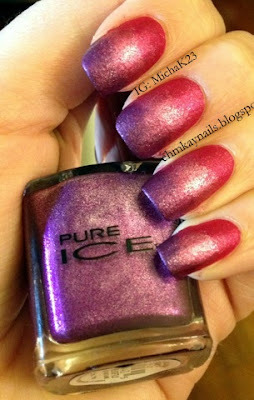 You all know how much I love suede polishes and this manicure was a match made in heaven! I used three of the Pure Ice Suedes that came out during the winter. I actually never found these and had a friend send me them. I started with a base of Pure Ice Draped which is a wonderful hot pink suede. 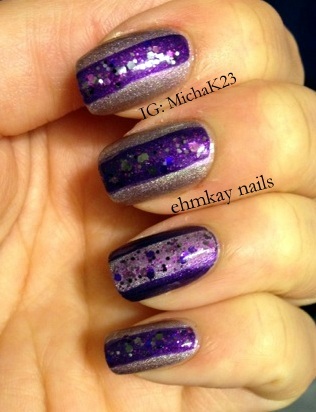 Then I did a gradient on top of Draped with Stunning and Touch Me Softly. I never really make my gradients seamless when I know I'm putting glitter over it, as I did here. People always ask me and I do the basic gradient method. I know people paint the entire sponge and then gradient but no time for that. 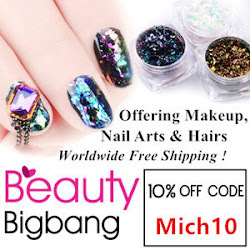 I rip a piece of makeup sponge, put some polish on tin foil and dip and gradient. Lastly I added one coat of Sonoma Nail Art Scooters-4-Hooters which was actually a polish that came out in October and SNA donated $5 of each bottle to a local organization which helps women get mammograms. 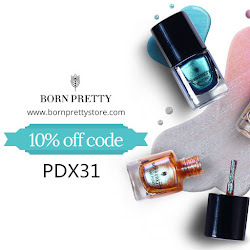 Great polish and a great cause! It's a simple pink and white glitter polish but I like the consistency in the size of this polish. It was the perfect topper without being too distracting over the gradient. What do you think of my multi-pink gradient? I need some bright green suedes to be made now! I love suedes! Misa Grey Matters was a huge lemming and a lovely lady in a polish group on Facebook sent it along to me. 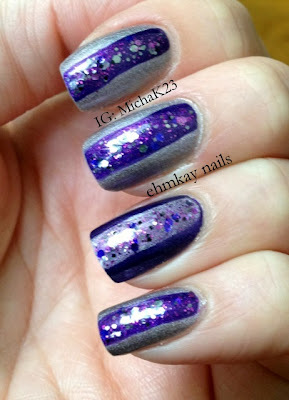 Grey Matters is an insanely gorgeous grey polish with darker grey flecks in it. It went on with two easy coats. I wanted to do some art but did not want to cover up Grey Matters so I decided to take Zoya Dovima and Zoya Loredana (which again, were apart of a crazy fun surprise package from Jen at My Nail Polish Obsession). I googled halfmoon dotticure and nothing came up with the idea I had in mind, so I went with it. I did it free hand by placing my hand on a desk and doing the top curve first. They aren't perfect but I'm happy with the results and wore this for days! I top coated Misa Grey Matters before adding the dots. I decided to keep Loredana and Dovima in their natural matte state. I liked the mixture of textures. Another Red Dog Designs winner. 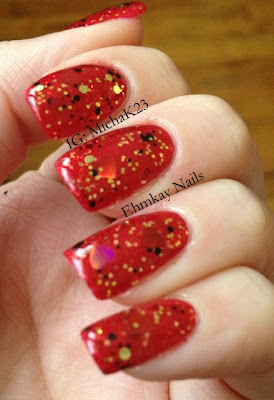 There's nothing better than a classy red nail polish and I wanted to fancy it up with this amazing glitter. First I took Orly Unlawful, which is a gorgeous red creme. I used ONE coat and no top coat and it is absolutely stunning. If you are looking for a great red creme, this is it. 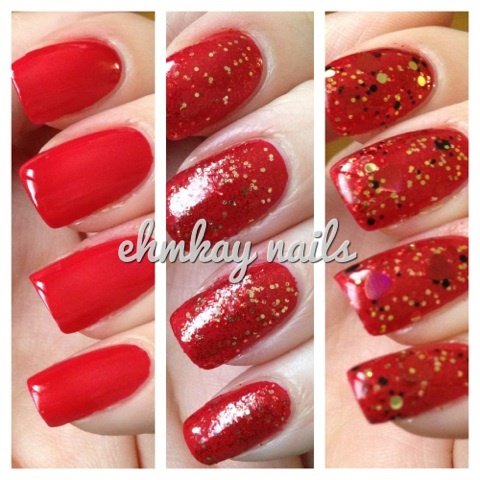 Then I used one coat of Orly Devil May Care on top of Unlawful. Devil May Care is a dense red and gold glitter. 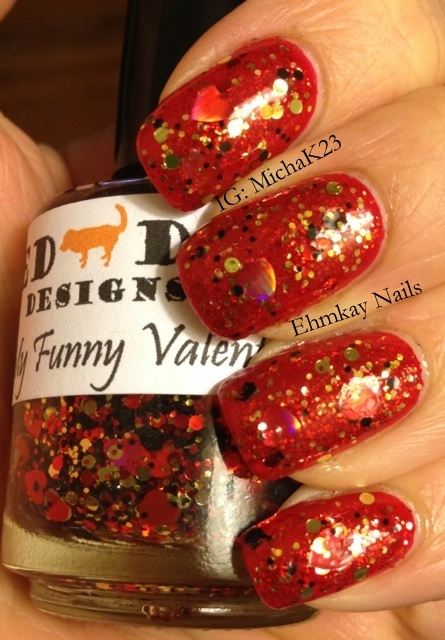 I actually won these from a giveaway on Orly's page and while I may not have bought them, I'm so happy I own them. Then the pièce de résistance, Red Dog Designs My Funny Valentine. 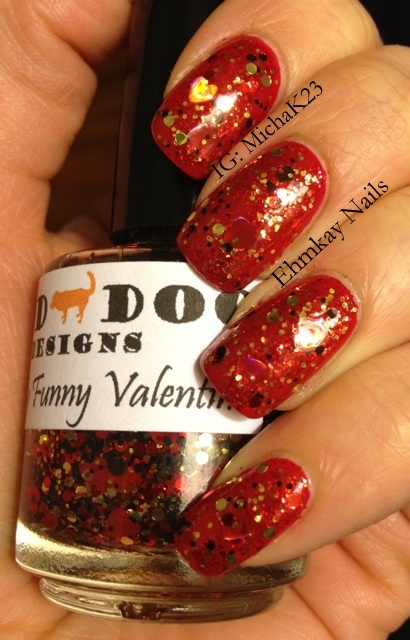 MFV is a great red glitter with accents of gold, black (which I thought was brown!!) 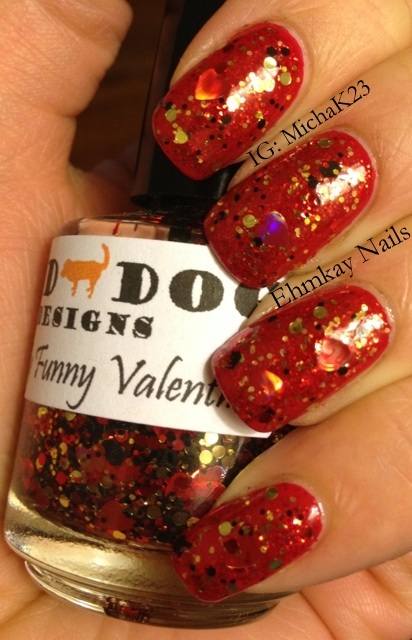 and red holographic hearts. The hearts are amazing and shift from orange to pink to purple to blue. 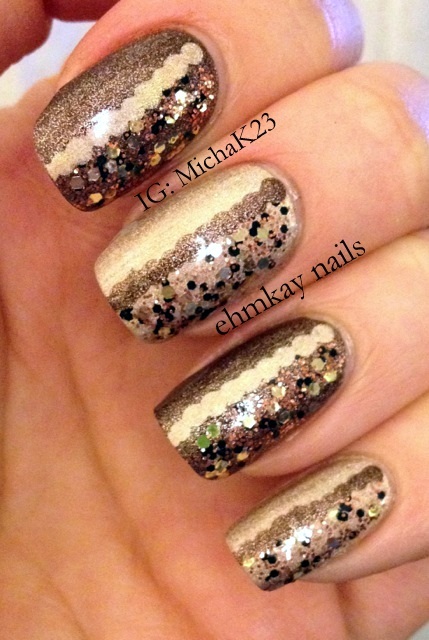 I love the accents of the gold circle glitter and the larger black hexes. 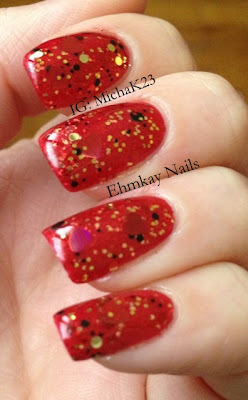 For some reason, this polish reminded me of chocolate covered strawberries. Can't wait to break this one out again. I've added a lot of pictures to show the shift of the hearts! 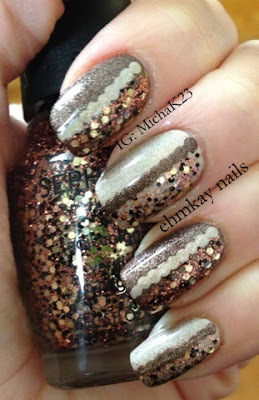 Here was a teaser I posted on my Facebook when I wore this NOTD, so make sure you subscribe and "like" my page! Hi all. 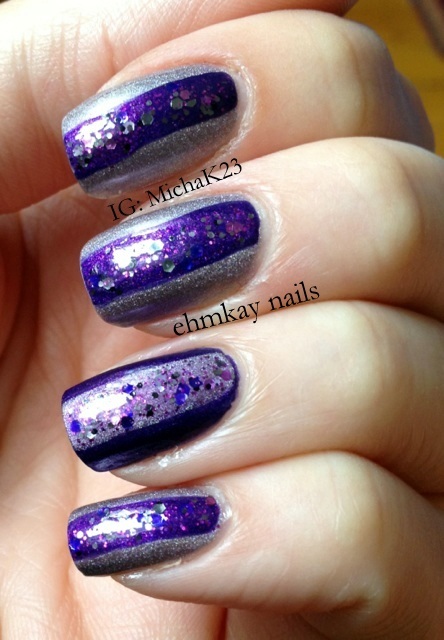 Today I created a purple manicure to support children who have parents in the military. To read more on this day, click on this link. 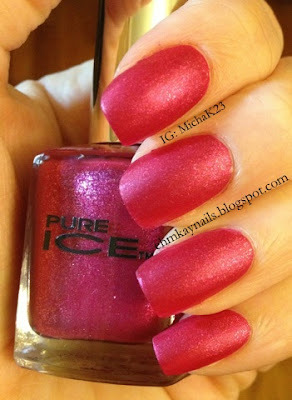 To create this look, I painted two coats of A England Princess Sabra on three on my nails. 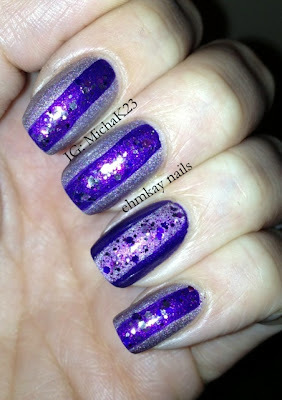 Princess Sabra is a lavender holographic polish which is delicate and gorgeous. On the accent nails (ring and thumb) I used two coats of Zoya Savita (an amazing matte velvet purple that Jen at My Nail Polish Obsession sent me!!). 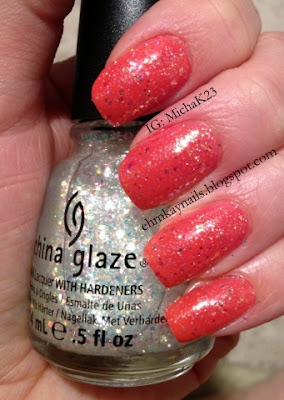 Savita is stunning and simply glows on the nail (see the pictures with flash). Then I free-handed (can't you tell by my not exactly straight lines??) a stripe with the alternating color. Last, I took Sonoma Nail Art Halloween in the Vines and put it over the stripe. Because Halloween has a tinted base, it changed the color of Princess Sabra, but I did not mind. This look was actually inspired by Jen when she posted a blue and white stripe mani in one of the Facebook groups we are in. Thanks for the inspiration. Do you think you will try this technique? It was super quick and I finished my mani in under 15 minutes. 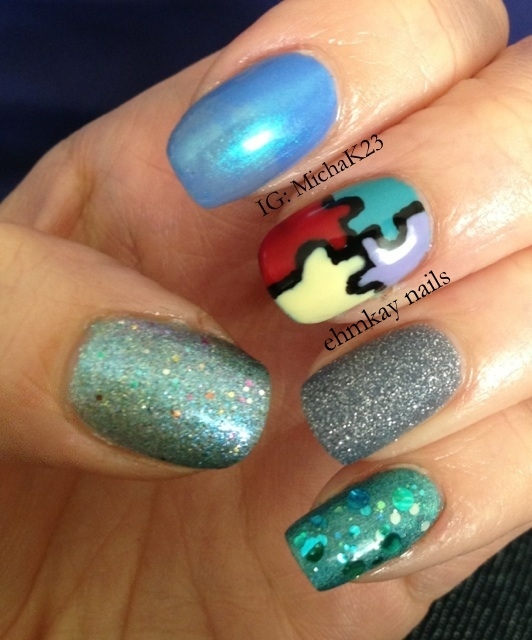 What an easy way to create a visually interesting manicure in little time. EDIT: This was my 100th post AND my 100th Instagram photo! What are the odds?! Phew, that title. 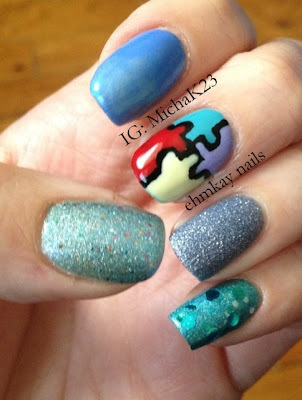 Here's a fun and quick little nail art I did. I was in a brown mood and this was the result. I don't always like to just slap a glitter on a base. I like to think of ways to use the glitter in a fun way. Here's what I came up with. 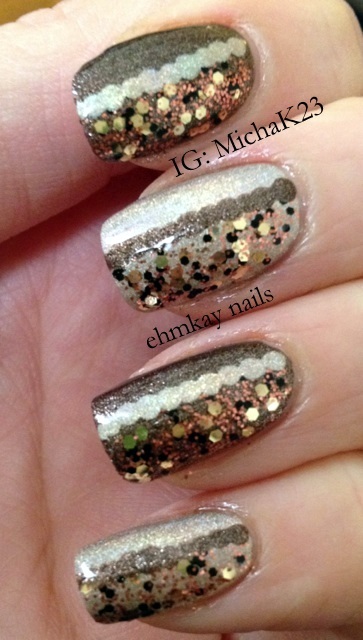 Mainstream companies are now coming out with "indie" type glitters and I loved the mix of black matte glitter with copper and gold glitter which is basically $OPI Come to Paparazzi. First I started with a base of OPI You Don't Know Jacques suede and Kiko Taupe holo on alternate nails. Both were two easy coats. 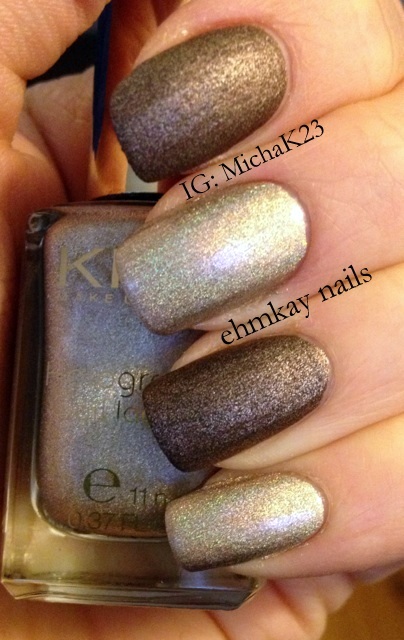 I love the suede polishes for how they look when top coated. They are just stunning. 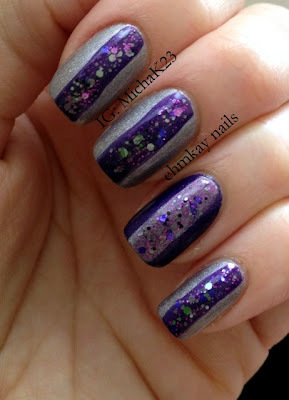 All I need is Zoya Harlow and I will have complete OPI and Zoya Matte collections! 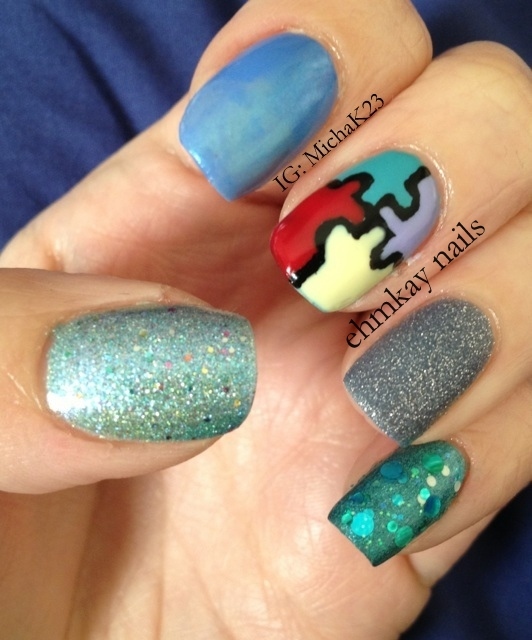 Then with Come to Paparazzi, I painted half the nail. With the alternate color of the base, I quickly dotted along the line. This was quick, easy, and added a little more interest to my mani than if I just slapped on the glitter. Can't wait to do this with more glitters. So what do you think? My sister wasn't a big fan of this one, but I loved it! Hello All! I still have to formally show you my Easter nails and my Walking Dead finale nails, but let's be on time for one thing, okay? 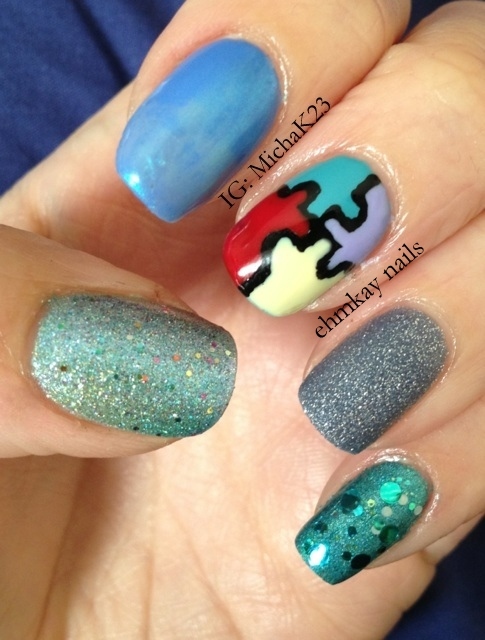 Yesterday was Autism Awareness day, but it is also all month. The official color for autism awareness is blue. I have a lot of experience dealing with children with autism. I don't talk about it often but it is something that has been a part of my life, so I think it's important that more people are aware of the vast spectrum of autism and the differences between high functioning and low functioning. Every person with autism has different personalities and no symptoms are alike. I think that is the most important aspect of awareness---that no two cases of autism are the same.